Overview - One of the biggest box office hits of all time delivers the ultimate encounter when mysterious and powerful aliens launch an all-out invasion against the human race. The spectacle begins when massive spaceships appear in Earth's skies. But wonder turns to terror as the ships blast destructive beams of fire down on cities all over the planet. Now the world's only hope lies with a determined band of survivors, uniting for one last strike against the invaders - before it's the end of mankind. 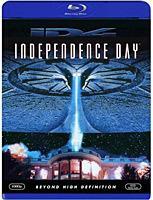 If ever a movie was sold by its theatrical trailer, it was 'Independence Day.' It only took audiences one look at that ominous shot of a UFO's shadow, towering over Earth and ready to blast us to smithereens, to trigger lines around the block. There seems to be no logical explanation for the enormous success of such a dim-witted film -- it's story was hardly new, the effects were good but not great, and the reviews were tepid at best. Yet 'ID4' grossed over $300 million in the US alone (even more worldwide), turning it into the biggest hit of the year. This is one of those movies that left me feeling totally out of step with popular culture. On paper, 'ID4' should have been a slam-dunk for me. It takes two of my favorite cinematic guilty pleasures -- the disaster movie and alien invasion flicks -- and marries them to old-fashioned popcorn cliches and a glorious cast of B-level stars. Unfortunately, with phoned-in melodrama so bad even Irwin Allen couldn't have written it, those initially cool shots of aliens about to destroy us are all 'ID4' really has going for it. Once the movie gets the big explosions out of the way, it collapses under the weight of endless sci-fi cliches and its own sheer hokiness. With a set-up right out of a '70s TV miniseries, the film begins by introducing us to an expansive cast of movie caricatures. (Look, there's Bill Pullman as the President! Will Smith as the cocky young fighter pilot! Jeff Goldblum as chaostician Ian Malcolm, er, scientist David Levinson!). Almost immediately, a sense of narrative irrelevance begins to nag at us, we know the film is only focusing on these one-dimensional characters because they are the ones who are going to live. All the dramatic interaction is just space filler as we mark time to the big special effects payoffs -- the money shots we've already seen in the trailer. Still, these opening scenes of alien destruction do possess a certain majestic visual power. 'ID4' was directed by Roland Emmerich ('Stargate,' 'Godzilla'), and though he's always been a derivative filmmaker, there is still some fun to be had in watching all the Spielberg-esque shots of dumbstruck civilians staring up at the sky, right before a big blue alien death ray zaps them into oblivion. One has faith that even a chintzy pastiche-maker like Emmerich will follow up such a gangbusters opening with some substance, or at least some compelling plot developments. Alas, once the alien invasion is over and the remaining survivors band together to defeat the enemy, 'ID4' completely falls apart. The script grafts in pop culture allusions that should have been cool but only end up feeling like second-rate 'X-Files' leftovers. The film is overstuffed with lame-brained plot threads (Area 51, government conspiracies, and even an alcoholic Randy Quaid flying a bi-plane all factor into the story), and while I can usually forgive a summer movie for the sin of well-intentioned stupidity, even I have my limits. By the time one of the characters created a computer virus to derail the alien's computer system (glad to know this superior race uses Macs), I just couldn't believe anyone would buy this jingo-ist nonsense, much less stand up and cheer it on. It also bugged me that Emmerich totally overdoes the humor. The film is jokey instead of clever, and even the self-referential moments only undermine any hint of realism the film created in the first act. The acting doesn't help either. I really disliked the smug performance by Smith (who seems to be playing to the cheap seats with his loud, shouting line readings), and Pullman is also terrible as the President (has there ever been an actor with less charisma?). Goldblum is a little more appealing, but that's simply because he's doing another riff on Ian Malcolm. I know this is 'ID4' and not 'The Hours,' but the rules of good characterization still apply -- you gotta care about the people first, or you're not going to care what happens to them. In hindsight, I must give some props to 'ID4' for capturing the zeitgeist of the time. In 1996, America was still dealing with the fall-out over the Gulf War, so a rah-rah movie like this (note how in the film the rest of the world just sits around, waiting for America to take action) certainly appealed to our need for a Reagen-esque return to mythic status. As a serious sci-fi film -- or even a decent entertainment -- 'ID4' has only suffered in the interim. Over ten years on, it feels like an artifact of another time, and quite frankly, it seems even stupider. 'Independence Day' hits Blu-ray with fan expectations high. It's fair to say that early adopters have long expected this to be a de facto demo disc, sight unseen, especially as previous video versions (namely the previous special edition DVD) have been somewhat wanting. I will say that I've always had mixed feeling about hailing 'ID4' as ideal for high-def, namely because the film was made before it was commonplace to polish transfers with computer-enhanced trickery, so I suspect those excepting an absolutely pristine presentation will be in for a disappointment. Indeed, 'ID4' looks exactly like a 1996 film should. Although I was very impressed with the cleanliness of the print here (there's nary a speckle or blemish to be seen), there is considerable grain, particularly on some of the darker effects shots. This gives 'ID4' a film-like look I found pleasing, but do expect some fluctuations in the intensity of the grain, as well as some instances of bobbing contrast. Otherwise, I was very happy with this 1080p/AVC MPEG-4 encode (which gets a BD-50 dual-layer disc in which to stretch its legs). Colors are easily the best I've seen in any video version of the film, especially the improved fleshtones and noticeably superior primaries. Detail is also very good, especially in daylight sequences, which often boast great depth and readily apparent dimensionality. Darker scenes are again comparatively disappointing in this regard, as they feel a bit flatter (though still look good), and all in all shadow delineation is above average for a film that is now over a decade old. I also appreciated the sharpness of the transfer, as it's ample but not marred with unsightly edge enhancement (which was a problem on most of the previous DVD versions). I wouldn't rate 'ID4' an absolute five-star Blu-ray due to the inconsistencies between light and dark scenes, but otherwise I was very pleased -- in fact, it even looks a bit better than I expected. Easily matching the video is this DTS-HD Lossless Master Audio 5.1 Surround (48kHz/16-bit, and French and Spanish 640kbps Dolby Digital 5.1 Surround dubs are also offered). It's a very dynamic mix that easily holds up to today's big-budget action spectaculars. Crank this baby up, because you're in for a treat. I was immediately startled by the deep, powerful bass. Time is not always kind to the big event movies of our youth, but 'ID4' holds up very well. The first shots of the ominous spacecraft hovering over Earth are accompanied by some serious low tones directed to the subwoofer -- this one is a real couch-mover. Dynamics are equally strong, with a noticeable expansiveness between the peaks and valleys of the soundtrack that sounds great at high volume. Dialogue is likewise quite well-balanced (it was always understandable), though I would still have liked to hear it bumped up ever-so-slightly in the mix. The only area where I was underwhelmed was with surround use. Certainly, the action is delivered with clear force -- the first act piece de resistance of the aliens blowing up treasured national landmarks is a whopper. Unfortunately, quiet scenes are lackluster. I longed for more sustained ambiance. The result is a bit of a Jekyll and Hyde soundtrack -- the action rocks, but the rest is bland. Of course, anyone picking up 'ID4' on Blu-ray probably doesn't care about sonic subtleties anyway, so I suppose few will mind such nitpicks. 'ID4' is another one of those catalog titles that Fox has issued on DVD so many times I've lost count. Unfortunately, none of them ever impressed me all that much in terms of bonus features -- the documentary material was all mostly rehashed promo fluff and utterly forgettable. Filmmaker Audio Commentary - Director Roland Emmerich and producer Dean Devlin sit down for a lively, engaging discussion. Even though I usually don't like the films the pair makes, I do like their commentaries. Emmerich in particular is full of enthusiasm for even the stupidest moments of 'ID4,' and he is sometimes so child-like that it almost makes me like the movie more. The pair is also open about the obvious influences that inspired 'ID4' (i.e, the countless other movies they ripped off), plus we get the usual backpatting about the cast (especially how great Will Smith is, yadda yadda yadda). A good, solid commentary that is certainly the best extra on the Blu-ray. 'ID4' was conceived in the grand tradition of stupid summer popcorn movie fun, and on that level it is hard to hate. Unfortunately, it is a pretty stupid film, and full of so many howlingly bad inconsistencies, contrivances, and hair-brained plot devices that it's hard to believe audiences didn't laugh it off the screen. In any case, this Blu-ray is easily the best the film has ever looked and sounded on home video. The extras are lackluster, but if you just want to watch the best version yet of 'ID4' on your home theater then this disc is worth checking out.